Netflix reportedly considering cheaper tier | What Hi-Fi? But will it arrive in the UK or US? Netflix's monthly fee of £7.99 ($11) may seem pretty reasonable for unlimited HD streaming of thousands of films and TVs on multiple devices, but in the face of ever-increasing competition (Disney's forthcoming rival service, for one), the streaming stalwart can't afford to take its foot off the pedal. And one way to keep it firmly on it would be to offer cheaper pricing. 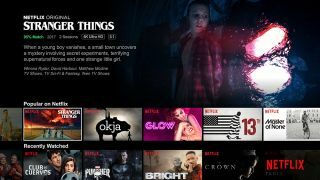 In an interview with Bloomberg last week, Netflix’s chief executive officer Reed Hastings said the company will test a lower-priced version of its service in select markets to boost sales. Reed didn’t commit to which markets this would be tested in or when this would happen - although he did note the service's potential to attract 100 million customers in India alone. Asia has been an area of slow growth for the service, which last week announced 17 new shows from five Asian countries. Of course, below the ‘standard’ plan in the UK and US is already a ‘basic’ £5.99 ($8)/month tier for SD streaming on one device. So how cheap and compromised would Netflix be willing to go? According to the report, the company would introduce a new tier or alternate version with different features rather than actually lower its existing tiers. Perhaps there'll be a mobile-only service, then. Or perhaps one that limits viewing or restricts the catalogue to Netflix-produced shows only.